"The monster inside my son" is kind of mind blowing. It's about an autistic kid who basically goes crazy after about 18. Beautiful short film: "World Builder"
This film about a man building a virtual world is beautiful and well executed. 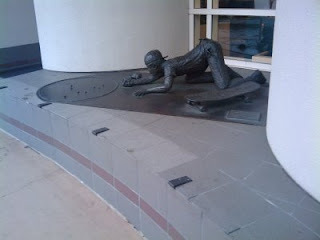 At the Kaiser clinic in Mountain View, California, there's a delightfully nostagic sculpture of a youngster playing marbles, skateboard at his side. And the metal stubs installed on the edge of the ledge next to the sculpture? There to block skateboarders from doing boardslides. Apparently only old-fashioned skateboarding is commemorable. Classic talk by Hamming: "You and Your Research"
I thought this talk about how to do Nobel-prize quality research was pretty insightful. I like the spirit of the Done Manifesto. I love these old color photographs. I always try to imagine old times in real life color instead of sepia, but I don't usually do it very well. These photos really make it easier to connect with my grandparents' generation. A canadian man asked a border guard to say please, and got pepper sprayed instead. Regardless of whether the guard should have been more polite, he shouldn't have harmed this guy. If a police authority can't agree with someone, then there's a whole legal system for determining what's right and wrong, and that system is designed to dispense justice without cruelty. Allowing officers to inflict pain on someone for /not following orders/ sets up the officer himself as a dictator who not only decides what's right and wrong, but dispenses cruel and unusual punishment that the courts wouldn't even be able to.